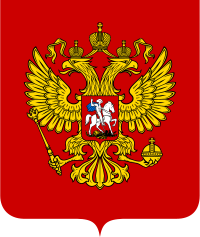 The heraldic device of the Russian Federation. Occasionally, the eagle found on the Federation's arms is used independently as an emblem. In appearance, this emblem itself resembles a full coat of arms. Gules a two-headed eagle each head imperially crowned holding in his dexter talon a sceptre and in his sinister talon a globus cruciger ensigned by an imperial crown all Or an inescutcheon displayed upon the breast gules a representation of a knight upon horseback slaying a dragon all Or. Àmì ọ̀pá àṣẹ ilẹ̀ Rọ́síà je ti orile-ede Rosia. Àtunṣe ojúewé yi gbẹ̀yìn wáyé ni ọjọ́ 9 Oṣù Kẹta 2013, ni ago 06:06.